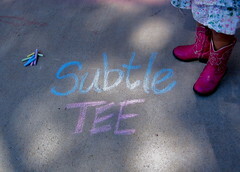 Subtle Tee: No-Sew 10 min Doily Top tutorial! No-Sew 10 min Doily Top tutorial! that doesn't involve any sewing at all??? It's so quick and easy, how could you not? This fancy little tank remodel makes the perfect homemade gift and takes just 10 minutes. But that's not even the best part of all, it's almost mess free to make and simple enough that Sienna helped me make the entire thing for her Aunt Dani's birthday present! Fold the doily over the front of the tank so that one half of the doily is in the front and the other in the back. Carefully clip off any extra edges that don't lay flat on the neckline. This might not be necessary, but depending on the type of doily you used you can dab a little Fray Blocker on the edges that you cut to prevent fraying. I didn't have to with mine, because I was able to clip along the string. Cut strips of the poly web adhesive to the length of the doily and carefully place between the doily and tank top. Use one for each side on the front and back. Depending on the shape of the doily, you can also add small pieces to the center and bottom. A little of this stuff goes a long way. Set the adhesive by applying direct heat with an iron for a few seconds. Don't forget to repeat for the inside of the tank top too. ...or just leave it as is! Love this idea. I may just have to try it with my $1 Doily! I will try this. Very cute! Danny you look great. I didn't know they sell cloth doilies at the dollar store. Hmmm I might use a tea napkin, ideas flowing! How simple but elegant! I'll have to make this one myself soon. Others liked these and so might you! I'd love a tee-tank with my spring! Summer swim lessons with a splash!